A gay friend of mine once told me—half-jokingly—that it was easier for him to come out as a homosexual than as a doll collector. He recounted to me how for years he had taken his dolls off a shelf in his apartment and hid them in a closet whenever he was expecting company. He described how he once literally threw them into a box while his sister knocked on his door for an unannounced visit. In my experience as a doll collector, this story, while amusing, isn’t all that far-fetched. I may not hide “my girls” when I have company, but I do find myself censoring myself when it comes to talking about my dolls. I’ve also found myself mentally categorizing my friends and colleagues into those who “know” and those who “don’t know”—much, I suppose, like a closeted homosexual. It’s no wonder we seek one another out for company. The company of other doll collectors is one of the few places we can revel in our love of all things doll and know we won’t be judged for it. So it’s safe to say that collecting dolls is far from mainstream. This line of thinking led me to wonder if any celebrities collect dolls—and, if so, what the general reaction to that is. The handful of famous people I already knew of who collect dolls of some sort (or at least are open about doing so) tend to be people who are otherwise perceived as—how shall I say this—“quirky.” The fact that Richard Simmons and Marie Osmond both collect and produce dolls doesn’t exactly lend a lot of credibility to the rest of us. Ditto for Morgan Fairchild, Annette Funicello, and Kathie Lee Gifford. What a prize he was. You’re better off without him, Demi. Demi Moore holds a Robert Tonner doll purchased for her at a charity auction by her then-husband Bruce Willis. I had dug up this information on Demi last week, while I was researching for this post on celebrity doll collectors. Demi seemed to be the most “mainstream” collector out there. And then, performing yet another doll/celebrity Google search, I saw a headline that I was certain I had read wrong. I wanted to shout it from the rooftops. 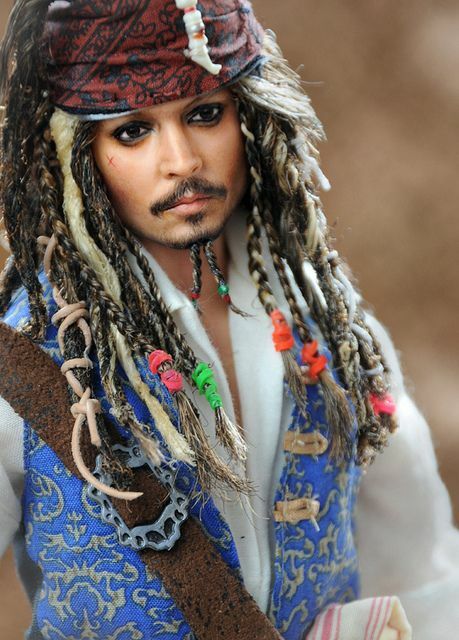 It appears that Johnny Depp, the coolest of the cool kids in Hollywood, one of the most respected, most celebrated male actors of our age, collects dolls. Apparently it will take more than Johnny Depp’s Barbie collection to break the general distaste and contempt our society as a whole reserves for doll collectors. I believe that even if that embodiment of the very pinnacle of masculinity itself—Don Draper—acknowledged possessing a doll collection, it still would likely not remove the stigma associated with it. Then again, I thought, perhaps it’s not so bad to be in the company of Johnny Depp and Demi Moore. Demi’s selection of fine artist dolls shows that she has a deep appreciation for art in doll form, and Depp’s admission that he enjoys accessorizing his celebrity dolls illustrates that he is open to expressing his creativity in unconventional ways. I’ve definitely been in worse company than that.